Our hospital is open seven days a week from 8:00am to 1:00am. Our team of emergency doctors and veterinary technicians focus on evaluating your pet’s condition quickly so that appropriate treatment can begin. From minor infections to life-threatening trauma, the AMC emergency team evaluates, diagnoses, and treats a range of medical problems including those that may require surgery. 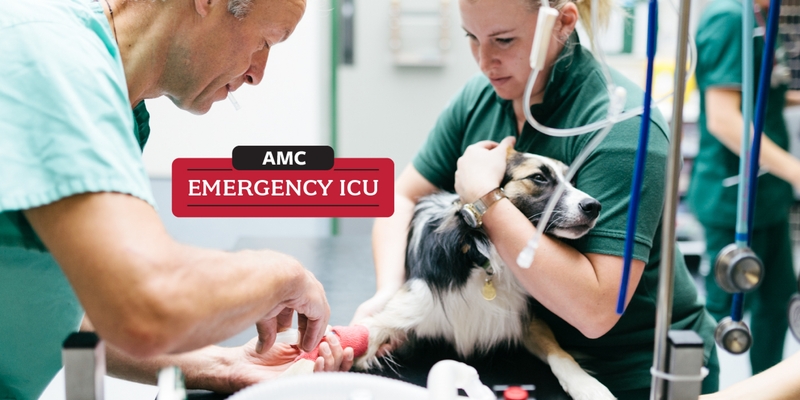 For pets requiring hospitalization, the inpatient unit and Intensive Care Unit (ICU) at AMC are designed for comfort and safety. Much like the ICU in a human hospital, the AMC ICU has sophisticated vital signs monitoring equipment and other technology to address your pet’s health needs. The ICU and inpatient unit are staffed with compassionate veterinarians, veterinary technicians, and veterinary assistants experienced in emergency medicine. The hospital is open for emergencies from 8:00am to 1:00am but has staff on the premises 24 hours a day to monitor patient care. The facility is equipped with a state-of-the-art intensive care unit, outfitted with advanced vital sign monitors (EKG, blood pressure, and oxygen saturation), ventilators, nebulizers, a blood bank, and oxygen therapy. Patients are supported by an on-site full service laboratory (hematology, blood chemistry, coagulation) for rapid test results, which is especially important when a patient is in critical condition.